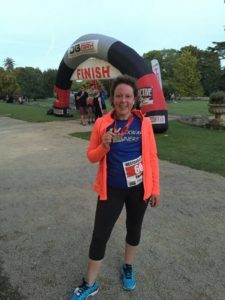 I started running just after the Olympics 2012, inspired to go back to sport, then did a few mountain bike events ( Tour de Moor for St. Luke’s Hospice in Plymouth and Devon Dirt). I thought I could do a triathlon so in July 2014 I did my first at 46 yrs old. Unfortunately on December 24th 2014 I was diagnosed with breast cancer. I had a mastectomy, chemo, radiotherapy and finished my herceprin injections in May 2016. I have a good sense of humour, so I joked that removing body parts is a bit extreme way to go, just to improve your running times due to weight loss and streamlining. I was only running for a medal at the Westonbirt 10K but it helps mentally to hang a medal up.